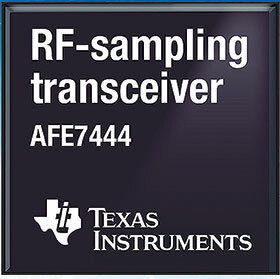 Texas Instruments introduced two new RF-sampling transceivers that are the first in the industry to integrate four analog-to-digital converters (ADCs) and four digital-to-analog converters (DACs) in a single chip. The quad-channel AFE7444 and dual-channel AFE7422 help engineers more easily achieve multi-antenna, direct RF sampling for radar, software defined radio and wireless 5G applications. While sampling up to 9 gigasamples per second (GSps) per DAC and up to 3 GSps per ADC, the AFE7444 receives and transmits up to 800 MHz of information from each of the four antennas, and the AFE7422 receives and transmits 1,2 GHz from each of the two antennas.